Many years before becoming known for her cooking, Chef Edie Robertson was a professional skateboarder and part of Team Sims! Maybe you saw her demonstrating her skills on the Merv Griffin show, or at one of the local skateboard parks. This year, Edie will be inducted into the Skateboarding Hall of Fame on Thursday, May 2, 2019, at a special ceremony honoring the skateboarders, industry pioneers and icons that have left an indelible imprint on the history of skateboarding and skate culture. The induction ceremony will be held at the Globe Theatre in Los Angeles from 5:00 pm – 10:00 pm. Please contact Edie if you are interested in attending! Chowder lovers readied their taste buds for the 7th annual Santa Barbara Chowder Festival on Sunday, October 16, 2016 at the Fess Parker DoubleTree Resort. Chef Edie was a guest judge this year! Numerous local wineries and brewers are also available for attendees to sample their finest, along with live music and both silent and live auctions. Proceeds benefited the Legal Aid Foundation and its mission to provide high-quality legal services to ensure that low-income persons and seniors have access to the civil justice system in times of crisis, and to secure safe, habitable shelter, adequate income and protection from domestic violence and elder abuse. Do you like chili? Do you like fun? Do you want to meet your neighbors? If you answered yes, yes, and yes – then come over to PATH Santa Barbara (Casa Esperanza) at 816 Cacique Street from 4 pm – 6 pm on Friday, September 23, 2016! Open to all, local businesses and PATH staff and volunteers will be cooking up some amazing chili recipes to be shared and judged for prizes! Chef Edie will be one of the judges. Come meet your neighbors and try some great food to start your weekend off right. 2:00 pm – 6:00 pm. 100% of the proceeds from your ticket go to the Foodbank of Santa Barbara County to provide healthy food and nutrition education. Roasted-local-organic-coffee-, cumin-, and smoked-paprika-rubbed marinated filet mignon with a flame-roasted red bell pepper harissa plus pork belly medallion. Photo by Paul Wellman. It’s getting to the point we might just name this the Edie Robertson BBQ Contest and be done with it — she’s won the professional meaty plate twice now, judged once, and won the pro-am veggie twice. In fact, we killed that latter category this year due to lack of entrants, and we believe it may be because other would-be veggie grillers didn’t sign up out of sheer fear. San Luis Obispo-based artist Diana Puntar presents Crave: Deflowered & Devoured/Stigma & Style, kicking off the 2014 season of this one-night only Crave experience. The evening will include an exotic and sensual five-course meal featuring symbolic aphrodisiacs, such as basil, oysters, figs, and honey. An immersive vibrating installation and a seductive, durational performance of “HONEY” by artists Julie Tolentino and Stosh Fila create a one-of-a-kind art and food event. 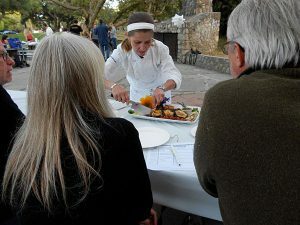 Puntar is working with local chef Edie Robertson, a leader of Santa Barbara’s Slow Food Convivium and veteran of the Food Network series Extreme Chef, to produce the enticing menu. This will be a unique evening of resonant cultural experience that is not to be missed! VEG-TACULAR: Edie Robertson’s perfectly spiced “steaks” won perfect scores. Photo by Paul Wellman. Since we started this showdown in 2010, there’s been only one year that Edie Robertson didn’t win something and that’s because we invited her to be a judge in 2011. 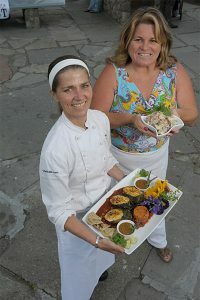 Otherwise, this private chef, who’s perhaps best known for her years at the Sojourner Café, has always wowed the judges. This time, she got nothing but perfect scores for her Flame-Grilled Seitan and Local Pistachio “Steaks”, which are injected with farmers’ market chimichurri and Drake Family Farms’ garlic chèvre, plus grilled seasonal veggies and avocado purée served stacked with gingered Hollister Brewing Company’s At Dawn Beer and balsamic tar, mango-passion fruit coulis, and micro greens. Chef Edie Wins the Vegetarian Division at the Independent’s Third Annual Grilling Showdown! Edie Robertson’s Flame-Grilled, Seitan-Stuffed Pasilla Chilies. Photo by Paul Wellman. Chef Edie Robertson explaining her winning entry to the judges at the Independent Competition. Photo by Helen Robertson. 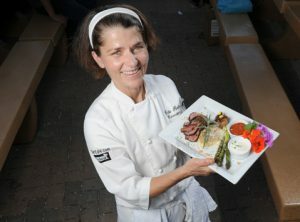 Catch Chef Edie at the Independent’s Sizzling Summer BBQ Contest Showdown this Friday, June 15th at Oak Park from 5pm – 7pm. Chef Edie is a finalist in the Professional BBQ Plate and Vegetarian BBQ Plate categories. 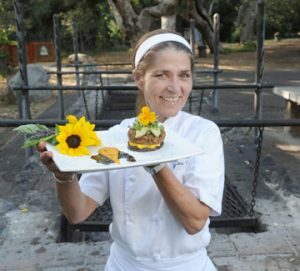 On Wednesday, May 16th, Jill’s Place welcomes Sunstone Winery and Guest Chef Edie Robertson for a unique food and wine tasting dinner featuring ingredients from the Santa Barbara Farmer’s Market. Prix fixe menu $38 per person, and includes dinner and wine. Make your reservations now – this event is sure to sell out! Call Jill’s Place today to reserve your seats: (805) 963-0378.